Being that I live in West Virginia, my choice of exotic and trendy foods is pretty limited. One of the dishes that's all the rage right now is Pho. Its a Vietnamese noodle soup, with one of the most interesting flavors your will ever experience. I've been craving it recently, but unfortunately there's not really any place around here to get it. No worries though, I just make my own. 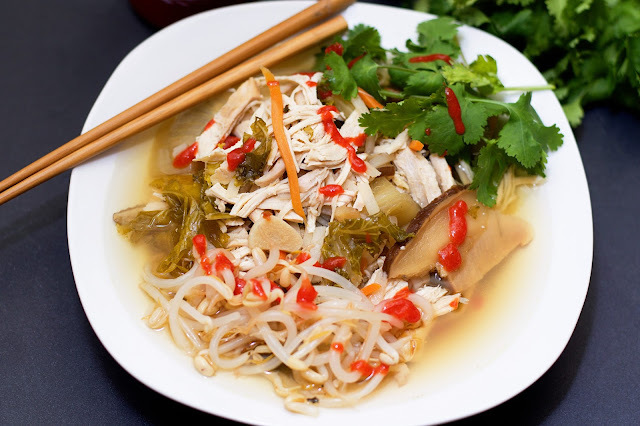 I've already shared my Beef Pho Recipe, my Vegetarian Pho recipe, so I was thinking that it would be a good time to do a Chicken Pho. To begin you will place the chicken into the bottom of the crock pot. 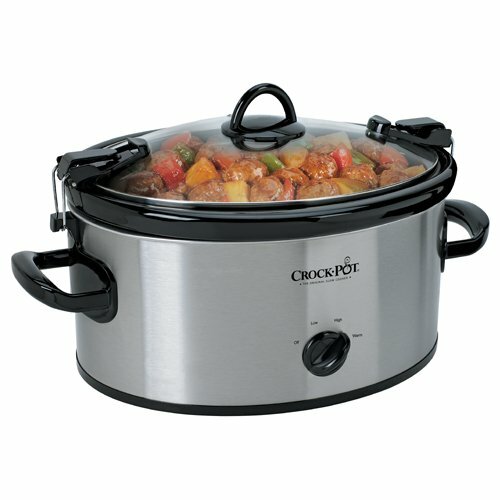 And in case you're wondering the Crock Pot Cook N' Carry 6-Quart Oval Manual Portable Slow Cooker is the crock pot I use. I'll leave a link to it (HERE). On top of that add the kale. Yes, I know, kale is not traditional to Pho, but I feel like if you have an opportunity to add greens to any meal you should. I like using the ones from the store. They hold up nicely in the crock pot. Because I like to eat my pho with chop sticks, I cut these quite thick, but honestly, they could have been thinner. Add the dried shiitake mushrooms. I chose dried since I was using this in the crock pot. I felt like they would hold up better with the long cooking time. Now it's time to pour in the chicken broth. Turn the crock pot on HIGH for 4-5 hours or LOW for 8-10 hours. After the pho has finished cooking, remove the chicken from the crock pot and add the rice noodles. I actually used the brown rice noodles for this Crock Pot Chicken Pho and thought they tasted great! Let the noodles sit in the hot broth for 10 minutes. return it to the pot and you are ready to go! Look at that beautiful bowl of Vietnamese goodness! The warm, spicy broth, savory chicken, tender vegetables. This soup is absolute heaven and perfect for all of this cold and wet winter weather we've been having. I topped mine with some bean sprouts, cilantro, and sriracha. YUM! The best part is that you made it in your crock out! 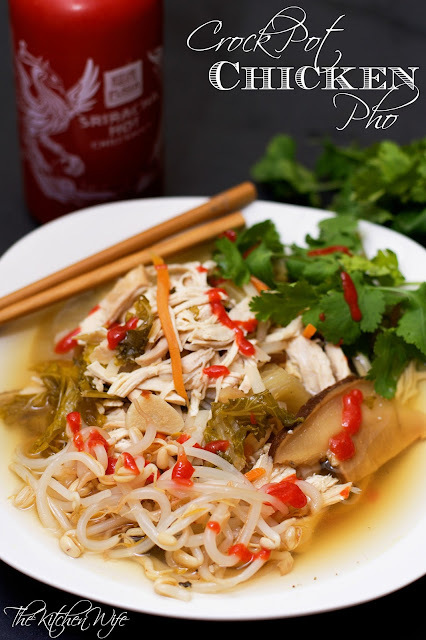 So if you are looking for something fun and exotic for dinner tonight give this Crock Pot Chicken Pho a try tonight! Place the chicken into the bottom of your crock pot. On top of the chicken add the kale, carrots, dried shiitake mushrooms, onion, garlic, ginger, chili flake, basil, and bay leaf. Cover and cook on LOW for 8-10 hours or LOW for 4-5. Remove the chicken from the crock pot and add the noodles to the broth. Let the noodles cook for 10 minutes. Shred the chicken and return the crock pot. Top with lime, jalapeño, bean sprouts, cilantro, and siriacha.